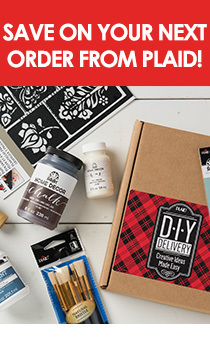 HomeBlog November 2014 How to Lunch n Learn with FolkArt Home Decor Chalk! How to Lunch n Learn with FolkArt Home Decor Chalk! Whether you are creating for yourself or for others, it is always lots of fun! This past week we all enjoyed another educational event at the Plaid corporate offices; it was our November Lunch n Learn event. As always, Plaid employees were able to share a yummy lunch and learn about our products through hands-on experience. This month, the featured product was FolkArt Home Decor Chalk. If you would like to see some behind the scene photos in progress, I invite you to view the November 14 post, "Plaid Lunch and Learn - FolkArt Home Decor Chalk." Employees had a choice between a small chest of drawers or a jewelry box and a choice between two different color combinations. To finish their project, all three waxes were also available. Today's post will take you step by step through one of project surfaces ... so let's get started! For our Lunch n Learn event, I shared the basic two-color, dry distress technique using FolkArt Home Decor Chalk. That means I applied a base color, a topcoat and sanded to distress; finishing my project with a coat of clear wax. There are many painting techniques that can be used with FolkArt Home Decor Chalk and this two-color, dry distress technique is one of the easiest and most loved. After I have gathered all my supplies, I like to get them ready for painting, which means opening the paint jars and removing the heat seal. Personally, I like to use a craft knife to cut along the jar lid to remove the foil heat seal. My small, unfinished wood jewelry box was really cute. It came with a hinged lid which when open, revealed a mirror backing as well as a sectioned removable drawer. There is a lot of surface area on this jewelry box, so I needed to think about each section's color placement. TIP: Using a two-color paint technique, it is best to think about what topcoat color will be featured on each section and then apply the basecoat color opposite of the topcoat. If that does not make sense, what I mean is this .... using the two chosen colors of Glacier and Maui Sand ... if you want to see Maui Sand as a topcoat, basecoat Glacier. So I looked over the project and decided my topcoat areas and then proceeded with basecoating. Because my project was so small I chose to use a 3/4" flat brush to paint rather than the small FolkArt Home Decor Chalk Brushes. The 3/4" flat brush enabled me to get into tight corners and also paint straight edges. You can see in this photo I am now coordinating some of the basecoat sections with both Glacier and Maui Sand. You might also be able to tell in this photo that the moisture of the paint is raising the nap or grain of the wood. This will happen with all paints, not to worry. In the distressing step, the wood will be sanded smooth and you will not longer feel any rough edges. And here's a look at my finished jewelry box all basecoated! It is best to wait two hours full drying time between coats, so I'll take a few moments to clean up my supplies. FolkArt Home Decor Chalk is waterbase, therefore, soap and water is all that is necessary while the paint is still wet. Don't you LOVE these two colors? Glacier is a very soft, pretty blue and Maui Sand is a warm, medium gray; together these two colors are definitely a winning combination ... in my book! Two hours later, it is time to apply the topcoat to each section. This time I painted the opposite color directly over the basecoat. In this photo, I am painting Glacier over the Maui Sand. Continue until the entire project has been painted with a topcoat opposite of the basecoat. Again, I waited for two hours to make sure it was fully dried. And here comes the exciting dry distressing technique. Using fine to medium grit sandpaper and while working one section at a time, begin sanding over the jewelry box surface. TIP: When sanding to distress, it is best to sand heavier in the areas that would appear worn such as around edges, near a handle, etc. The next step is to remove any sanding dust using a damp paper towel or a tack cloth. As a final touch to my FolkArt Home Decor Chalk jewelry chest, I sealed it with a coat of FolkArt Home Decor Clear Wax which also provides a layer of protection. Using the same 3/4" flat brush, I brushed on a coat of clear wax over the entire project surface. I allowed the wax to thoroughly dry, (sometimes I even wait overnight). Then using the cotton lint-free cotton cloth, the last step is to buff each section of the jewelry box to the desired sheen. It is as easy as that! I hope this has inspired you to create your own FolkArt Home Decor Chalk project!